Two different methodes were used, modifying the shape of the cooling tubes from a flat rectangle (1) to a circle (2) and increasing the number of tubes using a bifurcation joint (3). The flat rectangle tube shape was used at the smaller diameter of the combustion chamber and the circular shape at the wider diameter. For a smaller expansion ratio of the nozzle only this method was used. Another method was the use of tapered tubes with varying diameters. 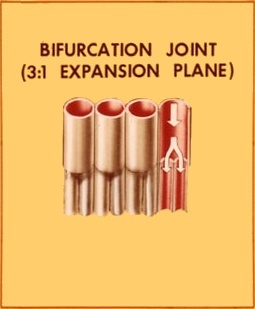 For a bigger expansion ratio of the nozzle, the number of tubes were doubled by using bifurcation joints (4). 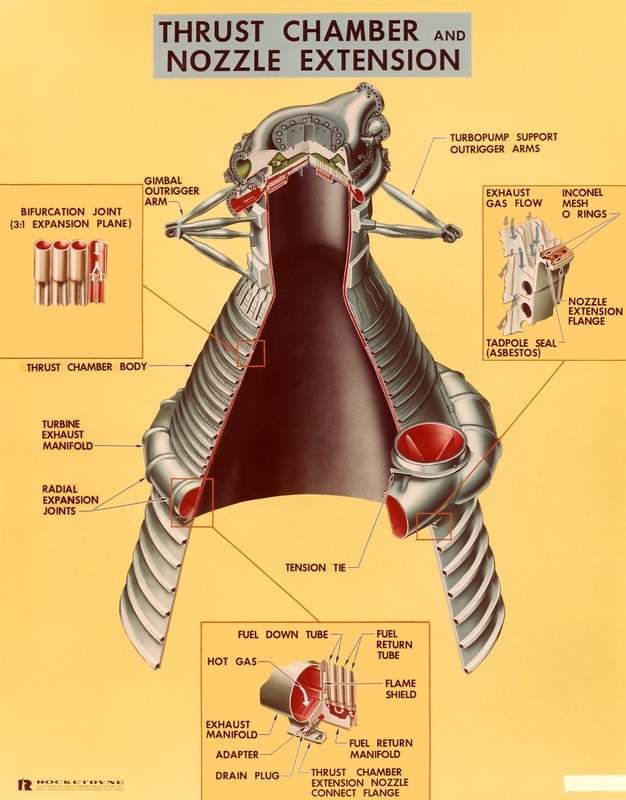 An initial design of the F-1 engine had two bifurcation joints for a fully liquid cooled nozzle, the flown version had only one bifurcation and a nozzle extension cooled with the gas from the turbine exhaust. The joints connected 178 primary tubes to 358 secondary tubes. 3000 feet of welding joints were needed between the parallel tubes. For more information about cooling of the F-1 engine see this excellent page. All links to pictures from this page. There are better ways to build a combustion chamber with cooling channels now than to weld it from a lot of tubes. The channels may be milled into the inner wall (made of copper) of the combustion chamber, then these channels are filled with electric conductive wax and the outer wall is build by electrolytic deposition of nickel. After that the wax is removed by heat and solvents. Another method is 3D printing. Very complex and difficult welding of many tubes as used for the F-1 engine is not necessary anymore. Not the answer you're looking for? Browse other questions tagged propulsion engine-design or ask your own question. How do you determine what the temperature will be in the combustion chamber of a rocket engine?